GIBC (Global Indian Business Council) and GIBV (Global Indians for Bharat Vikas) work in tandem to speed up development of Bharat. 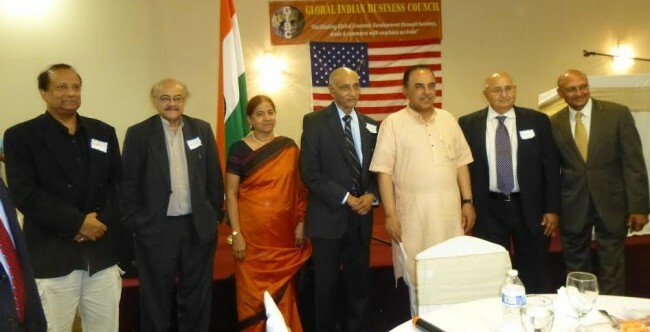 GIBC Directors with Dr. Swamy. 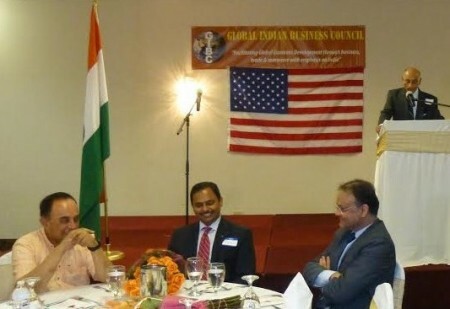 Atlanta, GA: Over 150 Atlantans attended the economic seminar hosted by the Global Indian Business Council (GIBC) on Monday, August 24, 2015 at Global Mall, Norcross, GA. A networking Dinner at the Ashiana Banquet Hall followed the seminar addressed by Dr. Subramanian Swamy, senior leader of the ruling Bharatiya Janata Party (BJP) and well-known economist. Dressed in his traditional kurta (loose shirt), Dr. Swamy enumerated the opportunities opened by the 18-month-old government under Prime Minister Narendra Modi. Speaking with his usual wit and candor, Dr. Swamy used deep historical knowledge and current economic figures to elaborate his own vision of economic growth of India. He explained the importance and the need for ensuring a level playing field to balance an unfair advantage to MNCs due to cheap and easily accessible Capital in USA and relatively cheap labor and logistics in India. He observed the US multi-national companies could borrow capital at 3% in USA for investment in India and take advantage of cheap Indian labor. On the other hand,India’s own small retail traders face a staggering 12% interest rates within India rendering them incapable of competition with the MNCs from overseas. Yet when it comes to allowing the Indian construction companies to compete/borrow capital in the US market by bringing with them their own lower-paid workforce fromIndia, theUSimmigration offices balk at the thought of cheap labor entering from India. He added, “The foreign direct investment lately has brought unique technologies and fostered innovation in India, primarily due to open heart welcome by the Indian government.” Swamy pointed out that 65% of the growth in the European Industrial Revolution as well as in the more recent American electronics and communications-based industrial revolutions came from innovation, versus less than 35% of India’s Soviet-style development until 1990. Swamy emphasized that India enjoys a huge Demographic Dividend presently with an average age of only 26 years compared to over 40 in Europe and Japan and 37 in the USA. The challenge for India thus is to educate this young population and inculcate risk-taking innovations and entrepreneurship in them. Using the Purchasing Power Parity (PPP) logic, a US dollar is an equivalent to Rs. 24, which hitherto puts, India among the top 5 economies in the world. With China possibly encountering problems similar to those faced by Japan for several decades in the past, India could even rise to become the #2 economy, second only to the United States projected Swamy. Both the US and Indian democracies share the open, transparent structures that are vital to innovation and advancement. Dr. Swami argued for abolishing the income tax in India, which mostly burdens only the working middle classes and particularly the young professionals.. The annual loss in revenue to the exchequer from the income tax cuts could be easily made up by fairly auctioning communication spectrum and coal rights at market rates. He reiterated that additionally far more investment resources could be freed by bringing back illegally accumulated holdings in offshore accounts in some 70 nations if the Government of India showed the resolve without corruption. Dr Subramanian Swamy with Consul General Nagesh Singh (R). Photos by Vakiti Creations. Earlier, welcoming Dr. Swamy, GIBC President-elect Dhiru Shah, praised him for his relentless challenges against corruption in India and for his advocacy in support for economic reforms to liberate the Indian economy from its socialist dogmas and needless bureaucratic shackles. 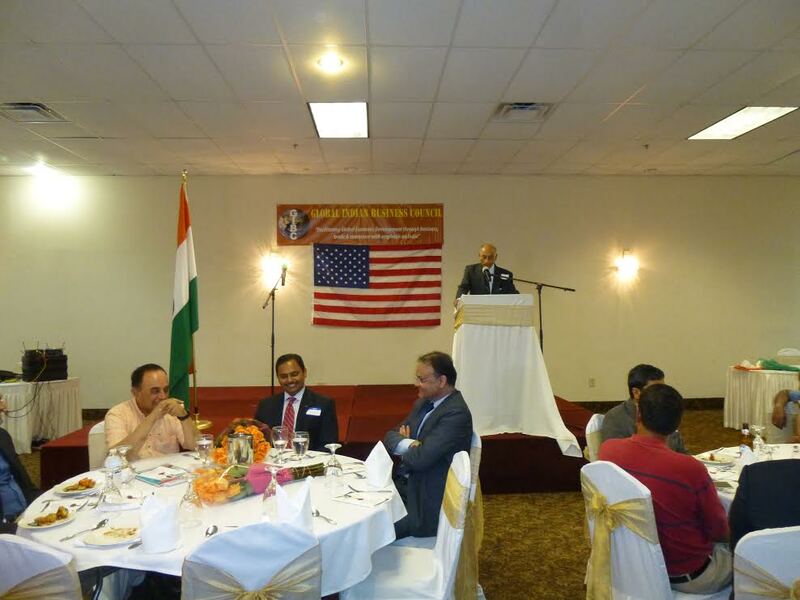 Shah also thanked Nagesh Singh, Consul General of India for his leadership and for making the Consulate General of India (CGI) Atlanta inclusively accessible in its outreach to the entire Indian American community in the Southeast USA. Outlining the mission of GIBC, Shah stated that GIBC was launched in 2014 in Atlanta with a clear objective of facilitating global economic development with emphasis on India through business, trade and commerce. 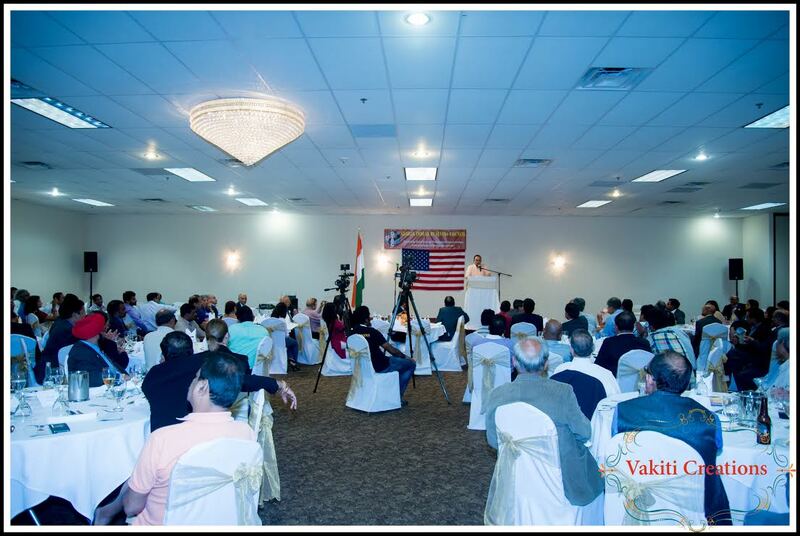 GIBC has already organized three successful economic seminars in Atlanta and one full day seminar in Ahmedabad in January 2015. To help the US and foreign companies to navigate the Indian rules and regulations, GIBC opened its first full-fledged office in Ahmedabad, India earlier in January 2015. A second office in New Delhi is to be opened in the immediate future. Collaborations with business chambers in Australia have also been setup, while other similar ventures are in the works. Another guest speaker, Sahil Jaggi, International Marketing manager of Atlanta-based United Parcel Service, spoke of the global shipping company’s large and fast-growing presence in India. He praised the initiatives that have made huge improvements in customs clearance and logistics in India, and was optimistic about strides in streamlining the processes and logistics. GIBC’s Subash Razdan, with his characteristic humor, introduced Dr. Swamy as the charismatic and dashing American-trained professor who had inspired his generation at the Indian Institute of Technology (IIT) inDelhiduring his stint at IIT as the Head of the Humanities Department in the early 1970s. During the Q&A session, CG Nagesh Singh pointed to the growing India-USA initiatives to boost education in India, including an exchange program with US-based experts. He pointed to Prime Minister Modi’s visit to Silicon Valley and his summit with President Obama as moves in the right direction to facilitate these endeavors. In response to the plight of the farmers, Dr. Swamy pointed to the need to empower Indian farmers with aggressive use of technology to open up global markets for them. Raman Gandhi was the emcee for the evening. Here is a telling contrast in fighting corruption. The nation has seen in the last couple of years two distinct endeavours to fight corruption. One is the fight for a new anti-corruption law with the blessings of even the suspects. And the other is identifying the suspects and fighting them under existing laws. Anna Hazare and his team have launched an agitation for an anti-corruption law — the Lokpal Bill — without which, they told the nation, corruption could not be fought or contained. In their enterprise against corruption they first appealed to Sonia Gandhi for her support to fight corruption! And she also wrote to Anna offering her support! Subramanian Swamy, on the other hand, took the view that corruption could well be fought under the existing anti-corruption law provided the corrupt are targeted directly. First, he filed an application with the prime minister for prosecuting A Raja for his role in the 2G scam. Next he applied to the prime minister for sanction to prosecute Sonia Gandhi, whose support Anna had sought to stop corruption. Swamy, a seasoned politician and accomplished intellectual, knew that without the visible picture of the corrupt, corruption is a theoretical issue — a point which the apolitical Anna and team had missed. How Subramanian Swamy has cornered the UPA finally is not a complex story. The 2G licence issue had all the trappings of an open air theatre scam from the day the licences were fraudulently issued, namely, on January 10, 2008. When the government was covering up the 2G issue, everyone was merely wondering how to fix the government. But Swamy acted. He filed an application on November 24, 2008, with Prime Minister Manmohan Singh for permission to prosecute A Raja who had issued the 2G licences. At that time Raja was a powerful minister in the ministry of UPA-I, being from the DMK that was dominant in the alliance. The anti-corruption law mandates that no court can look at a complaint against a public servant “except with the previous sanction” of the authority competent to remove the public servant from office. Since Raja was a minister, who could be removed by the PM, Swamy approached the PM for the sanction. The likes of Sibals and Chidambarams were perhaps laughing at Swamy. But Swamy persisted. He kept on writing letters to the prime minister reminding him about his application. He ceaselessly kept talking about it in public and through the media. But the prime minister, as he is sworn to in most matters, kept silent. The silence of the PM had made the government and the ruling party happy. But Swamy moved the Delhi High Court for a direction to the PM to take a decision on his plea. The high court dismissed Swamy’s petition. The ruling government and party were in ecstasy. But, undeterred, Swamy moved the Supreme Court. The PM had written to Swamy on March 10, 2010, that Swamy’s plea for prosecuting Raja was premature as the CBI was investigating the matter — a response authored by amateur legalism. After having trivialised Swamy thus, on April 26, 2010, the PM told the media — which asked him whether Raja’s statement that he had the approval of the PM to do what he did — that Raja had consulted him before issuing the licences. That what the PM had accepted as consultation, Raja has asserted as permission. Swamy also complained to the Supreme Court about the inordinate delay by the PM in deciding the matter. Meanwhile, the 2G issue had exploded on the face of the government with the report of the Comptroller and Auditor General (CAG) of India saying that the loss to the government was, on the lower side, some `69,000 crore and could be as high as `1,75,000 crore. The Supreme Court, seeing the government prevaricating at all levels, began monitoring the CBI investigation of the scam. The petition by Swamy too became part of the 2G scam litigation in the Supreme Court. The CBI did file charge-sheets in some cases of scam, including Raja as an accused in all except one. But Swamy’s plea to the PM to prosecute Raja and the PM’s inaction on it survived for consideration by the Supreme Court. The apex court did go deep into the matter, called for the records of the PMO and asked for an explanation from the PMO for the delay. By now, the ruling party and the government stopped laughing at Swamy. It became the turn of Swamy to laugh at them. It is the plea of Swamy to the PM to allow him to prosecute Raja which has been decided by the Supreme Court on January 31, 2012, in a landmark judgment. First, the court has set aside the judgment of the Delhi High Court that had refused to direct the PM to decide on Swamy’s plea. Second, it has ruled that it is the constitutional right of a citizen to move to prosecute any public servant. Third, the authority to whom the application is made for permission to prosecute should take a decision within three months and if, within four months, no decision is taken, the permission shall be deemed to be granted. The import of the Supreme Court judgment is evident. The court has clearly indicted Prime Minister Manmohan Singh for delaying the decision on Swamy’s plea. It has also directed him to decide on Swamy’s plea in 90 days. The court has also said that Parliament should lay down the guidelines for 2G prosecution. Finally, the court has said that for ordering inquiries into corruption against any public servant, criminal courts do not need sanction. It may appear at the first sight that the judgment is against Raja and the PM. But, in substance, it is just an ant-bite on Raja and an embarrassment for the PM. Raja, already charge-sheeted, is in jail. The PM will have no difficulty in allowing one more complaint — that of Swamy — against Raja. But the real danger lies in the other application by Swamy — for permission to prosecute Sonia Gandhi — which the PM has labelled as “premature” and ducked. Under the anti-corruption law, the PM can sack Sonia, the chairperson of National Advisory Council, even though he himself may be removed by her. Swamy can now ask the PM whether the complaint has matured. He can also move the criminal court for inquiry against Sonia Gandhi for which, the Supreme Court has ruled, no sanction is needed. Swamy’s statement that he “can bypass Vadra and go straight to Sonia” is ominous. The Congress cannot laugh at him now. S Gurumurthy is a well-known commentator on political and economic issues. At a time when Kapil Sibal’s statements on monitoring online content have raised a furore in India, his alma mater Harvard is engaged in free speech issues of its own. Two recent decisions taken by the Harvard University raise pertinent questions relating to the University’s ethos of dissemination, debate, and freedom of expression. The first concerns the decision to exclude Janata Party leader Subramanian Swamy’s courses from the Harvard Summer School course catalogue. The second is the University’s decision to close Harvard Yard to outsiders involved in the Occupy movement. Undoubtedly, the op-ed is execrable in so many ways, starting with cloaking itself with an understanding of social and religious history of India, and making suggestions that would leave a lot of people speechless with outrage just to think of them. Notwithstanding that, however, Harvard ought to stand for Mr. Swamy’s freedom of speech. Freedom of speech is probably the most sacred constitutional guarantee of all, and the true test of this sacred right is when someone uttering morally repugnant thoughts exercises it. The U.S. courts have long held that in times like these, there is a need to swallow hard and understand that, in a free society, any restriction on speech or expression must be taken under very serious consideration and pass some very stringent tests regarding public safety, and clear and present danger. To take just one example: recently, a case was brought against Fred Phelps, a pastor, who demonstrated at the funeral of a soldier killed in Iraq, with signs that said things like “Thank God for Dead Soldiers” and “You’re going to Hell” because, in his twisted mind, America’s war deaths were God’s punishment for the U.S. tolerating homosexuality. In the case brought by the dead soldier’s father alleging an injury for the intentional infliction of emotional distress, the U.S. Supreme Court held for Fred Phelps (protecting his right of speech), and against the dead soldier’s father by a vote of 8-1. In doing so, the U.S. Supreme Court solidified the notion that underlying the constitutional protection of freedom of speech and expression are values that transcend what people like Mr. Phelps and Mr. Swamy say — values important to everyone. And when free speech rights are attacked, if one allows the least popular and morally abhorrent people to be deprived of their free speech rights, then it is not long before others are deprived too. Thus the battle for free speech is always fought on the fringes, with people whose thoughts find scant endorsement. Protecting their rights does an essential public service, because it protects everyone’s rights. Although the subject matter could not be more different, the second decision displays the same oppositional stand of Harvard against a libertarian conception for freedom. It relates to the University’s decision to close Harvard Yard to outsiders engaged in the Occupy movement that has erupted all around America. Harvard Yard is a calm and vibrant community space where students, tourists, and community members sit and stroll. Many buildings, including dormitories, libraries, a church and lecture halls, surround it. In the month of November, tents had sprouted on Harvard Yard in solidarity with the Occupy movement. The Occupy movement at Harvard was made up of Harvard students, staff and faculty, and posed no threat to the security of Harvard affiliates. However, on the pretext of security, the University ordered a complete lock-down of the campus, thereby depriving outside protestors the basic freedom to have an open conversation on the campus. In doing so, Harvard reinforced institutional exclusivity and elitism — features that the Occupy movements seek to change. Many professors of Harvard shared this sentiment. Notably, Duncan Kennedy, a Law School professor, wrote an open letter to Harvard President Drew Faust expressing his dissatisfaction with the way the University administration handled the protest. Without a doubt, the decision to close the gates amounts to a violation of the freedom of assembly in the most general sense by saying that Harvard is off limits to those that seek to engage in a public-spirited discussion. It is bewildering how a peaceful movement in protest against economic inequality would provoke the lock-down of a University that admits students because of their commitment to the democratic values of an open and just society. This, and the decision to rebuke Mr. Swamy, is precisely the sort of action that a university dedicated to intellectual freedom must seek to avoid. It is central to Harvard’s thriving as a centre of excellence that it immediately reassures that freedom of expression will be protected at Harvard. The University must honour its commitment to policies that allow diverse opinions to flourish and to be heard. And who knows in doing so, Harvard might just provide its famous Indian alumnus, who has recently been at the receiving end of a lot of flak, a much-needed free speech message. A side benefit of Anaa Hazare’s agitation: True colors of Muslim. Christian and Dalit leaders are out in open for all to see. These Muslim leaders, who have nothing to do with democracy world over, who ask for enforcing Sharia law wherever they have a clout, who do not let a Hindu procession pass without creating trouble, are suddenly in love with democracy and parliament. Their gripe is that Sri Sri Ravi Shankar, Dr. Subramanian Swamy and Varun Gandhi are with Anaa. That Kiran Bedi and Kejriwal had supposedly opposed appointment of a Muslim for the position of Chief Information Commissioner. These “democratic” leaders have no compunction in denying others their rights. They want to decide who can and cannot support Anaa. Well, those days are coming to an end pretty fast because their sugar daddy, Congress is on its last legs. Zafaryab Jilani and his ‘head in the sand’ cohorts are shouting from the roof tops. Self styled messiahs of the Dalits and Christians like Udit Raj, Kancha Ilaiah, John Dayal and Joseph D’Souza want reservations within Lokpals and Lokayuktas and yet they talk of democracy. Whether it is singing of Vande Mataram or Sarswati Vandana, or Ram Manidr at Ayodhya, they have missed the bus to join the mainstream many a times. These time they are missing the bus once again but this is the last bus. All thinking citizens should expose these characters, not because of their religious persuasion but because of their anti-Hindu tirade. let us throw them in the dustbin of history. This chorus is heard the Urdu press as well. The Mumbai, Kanpur, Bareilly, Lucknow and Delhi-based Inquilab on August 17 interviewed several prominent community leaders, including chief of the Jamat-e-Islami, Maulana Jalaluddin Umri. Their refrain: We agree with the need for a strong Lokpal but not with the method of pushing it through. The politics of Arvind Kejriwal and Kiran Bedi may be fuzzy but their association with certain “causes” has raised questions, too. Last year, Kejriwal and Bedi herself led the drive to target the Chief Information Commissioner and insist that Bedi be made the CIC. In fact, when then CIC Wajahat Habibullah resigned last year and there was a chance that M M Ansari (now Kashmir interlocutor) would take over, Kejriwal lobbied with Leader of Opposition L K Advani keen to ensure that his name not be accepted. Kejriwal and Bedi have also shared platforms put up by Youth for Equality and Art of Living. On March 1 in 2009, for example, Kejriwal and Bedi addressed the Youth for Equality and talked of both terrorism and corruption. Youth for Equality has blamed reservation for shrinking opportunities. Since Sonia Gandhi has chosen to keep secret her medical condition and whereabouts from the nation, one may be excused to speculate. Innocent citizens cannot be faulted for rumors and innuendos since they are deprived of authentic information by the Gandhi family itself. Here is one possible scenario. Ever wondered why the Congress is so tight lipped about this so called ‘surgery’? Ever wondered why this shroud of secrecy behind her surgery? Ever wondered why Madam Gandhi had to go at this time for surgery? And what was the ailment that could not have been attended to by Indian doctors? Ever wondered that she is accompnied by her family members AND NOT A SINGLE DOCTOR (NOT EVEN HER PERSONAL PHYSICIAN) has accompanied her. Most unusual! If the then Prime MInister Atal Bihari Vajpayee’s knees could have been replaced in Mumbai by a surgeon of Indian origin, why Madam Gandhi needed to go abroad for her surgery? And even Manmohan Singh though a pensioner of the World bank and able to get free medical treatment in the US, got his heart surgery done in Delhi……. And has she actually gone to the US or some other country? It is strongly suspected that the need for her to go abroad at this time is linked to the fact that Dr. Subramaniam Swamy’s petition for the permission to prosecute Madam Gandhi (an MP) for corruption charges, pending with the Prime Minister’s Office, has to be decided before the end of August this year. Madam Gandhi is actually suffering from an acute enlargement of her wealth gland. The real surgery for which Madam Gandhi has gone abroad has to do with the operation of her illegal bank accounts, as time is running out for her and her cronies. That is why even Kalanidhi Maran has disappeared from Chennai and is rumored to have escaped to Zurich. 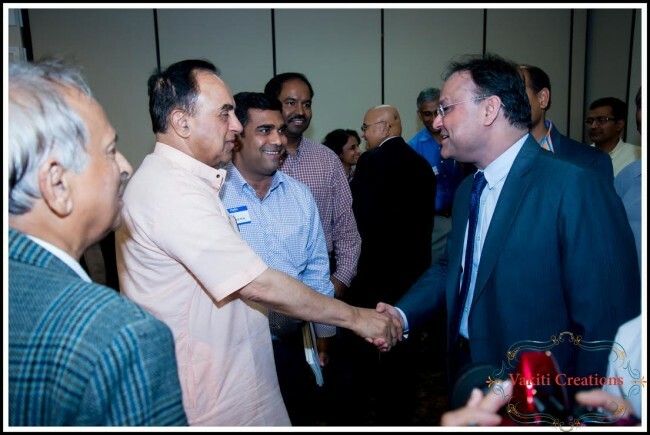 Of the many politicians who have taken up the task to bring the perpetrators of the 2G scam to justice, Subramanian Swamy stands out for his doggedness and an almost missionary zeal. He did not stop at merely stirring the murky pot and pursuing the matter in the courts; Swamy has now written an exhaustive account of the scam. While the massive irregularities the Telecom Ministry indulged in during A Raja’s tenure as Union Telecom Ministry is now all in the public domain, and whatever is not known will be out in the course of the investigations, the book is relevant for two reasons: One, it is a valuable reference material for academics, commentators and students of contemporary subjects; and, two, it raises larger issues of governance in an increasingly industrialised nation, where narrow materialistic considerations threaten to outweigh the larger national good. The author takes us into the frightening reality of how corrupt the country is perceived by international agencies and the general causes of the malaise. From fudged accounts of corporate entities to the generation and siphoning away of black money to the role of illicit funds in promoting terror activities, he gives us a quick take on the vast and seemingly unmanageable problem. Towards the end, Swamy suggests a national policy to counter it. This would involve the integration of “spiritual values and organisational leadership”. He lays emphasis on the incorporation of the “evolved youth” in the plan since that alone could create a “modern mindset”. But for that to happen, as he rightly points out, there will have to be a greater accountability in governance — something that the political class talks of a lot but does precious little to execute. What remains unsaid, therefore, is that such a national policy will not be forthcoming unless the people, especially the youth, compel the Government to respond. The author has relied on a heap of material that has emerged through the investigations, including the various correspondences among Ministers and Government officials on the subject. Again, while they are all known, they help in maintaining the focus and keep the issue in perspective, highlighting the callousness of those in power in allowing the scam to take shape. The Comptroller and Auditor General’s observations, too, have been used extensively, and rightly so, because it is the CAG findings that officially set the ball rolling for a probe, involving the Central Vigilance Commission and the Central Bureau of Investigation. The latter had been rather reluctant in fully involving itself till the Supreme Court cracked the whip. The large canvas of the scam included a number of personalities and institutions, and the author has done well to approach the issue in an uncluttered fashion. He has neatly categorised the important developments, such as those involving CAG, the Public Accounts Committee, the Radia tapes and the Telecom Regulatory Authority of India. He has also provided a chronology of the event dating from September 24, 2007, to January 25, 2008 — the time when the Telecom Ministry took the stand that no application under the Unified Access Services (UAS) would be accepted after October 10, 2007, to the questionable issuance of those licences. Swamy puts on record that then TRAI chief Nripendra Misra had said that the Ministry had never sought the authority’s views on grant of new licences. This is important since the Government has been saying that it had complied with TRAI guidelines. In fact, TRAI also took the position that its opinion should be sought even if the Telecom Ministry issued fresh licences under the existing policy. Misra had also warned the Government against what is now famously quoted as “cherry picking” of the recommendations the Authority had made on the matter of issuing licences. A great deal of what the book contains will sound familiar to the regular readers of The Pioneer. The daily had been the first to break the 2G scam through a series of articles beginning 2008-end. For more than 18 months, The Pioneer continued to publish one informed expose after another, detailing the murky business of the 2G deal. The end result was that the authorities, compelled by the exposes and driven by the Supreme Court, had to take finally note and act. There are many heroes in this tale. While Swamy is certainly one of them, he has been quick to acknowledge the others, particularly the whistle blower, Ashirvatham Achari, without whose cooperation the scam would have remained buried in the sands of time. The Pioneer correspondent J Gopikrishnan doggedly pursued the story, flinging aside temptations that were laid his way by those who wanted the matter forgotten. He is the other hero the author names. While the probe is now on track and there is hope that the guilty will be eventually punished, the fact remains that a scam of this magnitude can happen again. The book provides some solutions to prevent that, but it is for the political class to wake up and recognise that. Meanwhile, we need more such whistle-blowers, news correspondents and activists. 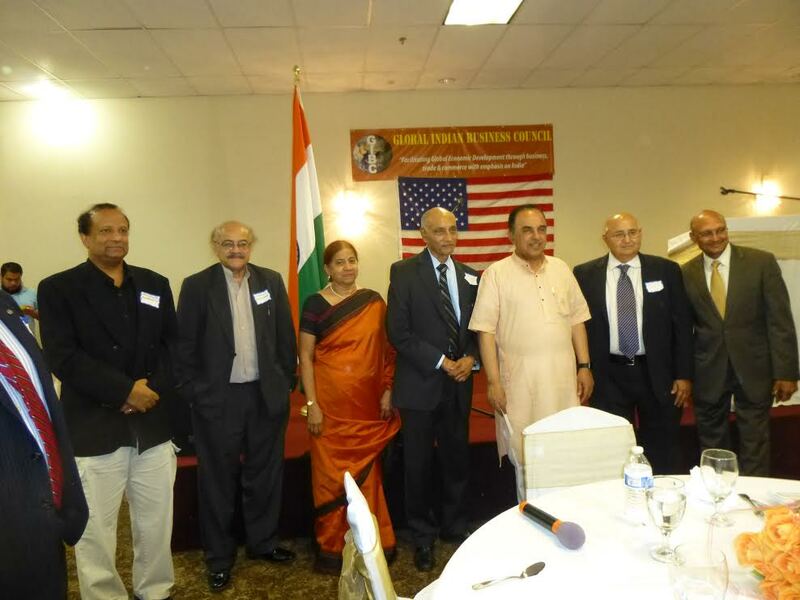 K.B.NAIRCERRITOS , CA – In a hard hitting speech Janata Party Leader, Dr Subramanian Swamy lashed out at the Congress administration and its role in the several corruption scandals which are rocking India and proclaimed that the country is on the verge of a major upheaval in which by the end of the year many in the present Government would find themselves out of power and behind bars. He made this statement at a public meeting organized by the Bhartiya Vichar Manch in the Sierra Room of the Cerritos Center for the Performing Arts on July 31. He went on to state that the strong movement against corruption is gaining momentum and predicted it would lead to elections being called early next year. Dr Swamy started his address following the screening of a short video titled “ India- Republic of Scams” which briefly outlines the state of affairs in India resulting from alleged large scale scams and urges people to get involved in saving the country from disaster. Against this background Dr Swamy broke down his speech into three broad headings starting with what is corruption, followed by how it negatively impacts the country and finally what is the solution to the problem. In defining corruption as a crime when a public office is misused for private gain, Dr Swamy said he was not referring to the small sums of money which changes hands at lower administrative levels which he thinks is unpreventable. What he finds disturbing is the scale to which corruption has escalated depriving the Government of several million dollars of revenue and thereby seriously undermining the financial stability of the nation. He went into the details a couple of such cases where ministers had used their positions for their personal financial gain or their kith and kin. The first he touched on related to the construction of the Sethusamudram Shipping Canal Project which proposed to link the Palk Bay and the Gulf of Manar. Dr Swamy alleges the project was aggressively promoted with the intention of benefiting the companies of family and relatives of the then Shipping Minister through construction, shipping and dredging contracts related to the project. The second was the most volatile and recent 2G scam over which controversy is still raging across the country. A significant part of his address was devoted to this subject in which after explaining its technical details he went on to describe how the then Telecommunications Minister A. Raja, by twisting the rules, masterminded the sale of spectrum to Swan and Unitech in which he had a stake, at throwaway prices on account of which the nation lost a staggering $ 40 billion in revenue. This apart, he added the complex international financial transactions involved in the process would in itself pose immense security risks as anti national individuals and organizations had stakes in the foreign companies associated with the scheme, which in turn could be utilized to finance and support its own terrorist activities in India. Dr.Swamy named individuals who had connections to the gangster Dawood Ibrahim and the ISI. Every time Dr Subramanian Swamy quoted how he had thwarted efforts by those in power to cover the scams by moving the Courts, he was met with thunderous applause from the audience. Among the more serious ramifications of accumulation of such huge quantities of unaccounted wealth Dr Swamy stated was the lavish life style of those possessing them because of which there is an alarming shift from production of consumer goods for the average general public to the catering of luxury goods to the rich where the margins are far more attractive. Also inevitable is the skyrocketing prices of real estate and the illegal trade in food items and necessities resulting in inflation shooting to 16%. Another is the stashing of undeclared wealth in foreign banks which not only do not pay interest but charge a 2% service fee thus depriving the country of crores of rupees of revenue for its social programs. He also went on to explain procedures through which by the use of “participatory notes” the payment of Capital gains tax is cleverly avoided in transactions involving foreign currency. In providing solutions to the colossal corruption problem Dr Swamy expressed the prevailing laws are sufficient but time consuming but in the short term he suggested the appointment of an independent prosecutor with sufficient powers to proceed legally against those who break the law so swift justice is arrived at. As an example he quoted the case of Bernie Madoff in the US who was convicted and incarcerated within 6 months whereas Ramalinga Raju’s case in the Satyam scandal is still pending mired in the Indian legal system for years. In the long term he called for a Renaissance of Indian traditional social values of Sanatan Dharma and by giving up the current trend of the relentless pursuit of making money ushered in by the hunger for material prosperity and globalization. He pointed out that money alone does not bring happiness as it proven by the fact that droves of wealthy individuals are arriving in India to find peace and purpose in their lives. Give Bail to Kanimozi and Raja- Jaswant Singh Really? A pick-pocket if he is caught, is thrashed in such a way that sometimes, he dies of injuries.And he is hand-cuffed and jailed. The amount involved may be small. But still crime is a crime. Raja and Kanimozhi and co. had looted India – depriving the poor and the downtrodden of many essential things in life. Instead of coming down heavily on corruption and corrupt practices, Jaswant wants the judiciary to be soft on Kanimozhi and Raja. I think, there is some quid pro quo. In fact, neither Jaswant nor the BJP is taking anything seriously. They, along with cogress buried the Bofors. They along with congress ignored the massacre and ethnic cleansing of Hindus in Kashmir. In fact,Subramanian Swamy and a couple of newspapers – like TNIE, Pioneer,Deccan chronicle. etc, keep the issue alive for logical conclusion. Advani,Sushma,Gadkari and the supreme court Lawyer, Jaitley – all are behaving like clowns. They have never fought a single issue to the logical end. Inspite of huge scams, congress is running the government as if nothing has happened. Why? Because, the BJP as opposition is useless. Now people begin to wonder whether BJP may be having skeletons in their cupboards – hence, the quid pro quo. If this situation continues, BJP may be decimated in the next elections. Jaswant is a shame on BJP and BJP is a shame on India. Swami Nigamanandji’s death due to fasting is a big shock. While politicians play one upmanship and try to find advantage even in death, what is disturbing is that practically no one knew about Swami Nigamanandji’s fast. Why the media did not pick up on this story for four long months is a question we need to ask. Why VHP did not highlight it? I do not know if they did but I have not seen any reports on it. What is happening with our religious places which are also our cultural heritage sites is very troublesome. Whether it is the quarrying in the Ganga basin in Haridwar, building of a dam on Gangaji in earthquake prone area or illegal mining of Vrajbhumi, what is happening is the permanent loss of history and cultural heritage. This is no less than the menace of corruption and black money. The fight against corruption and black money would be won some day but by the time our nation wakes up to the disaster of ruins visited on our historical and cultural places, if it ever does, it would be too late. We can blame the Muslims invaders for vandalizing our shrines and centers of learning and rightly so, but who do we have to blame but our own Hindu people and politicians for the naked aggression on our heritage because of their insatiable greed? I am grieved by the death of Swami Nigamanandji but I have come to a conclusion (and Dr. Subramanian Swamy said the same thing when Baba Ramdev broke his fast) that you can use fast as a weapon only against those who have a heart. In today’s aasuric and adharmic world, one has to use the appropriate weapons as were used by Shree Krishna and Pandavas. I am glad that Shree Krishna did not advice Yudhisthir to go on fast against Kauravas. Come to think of it, how many instances you can find in our scriptures where people went on fast to right a wrong? Gandhiji made fasting fashionable but someone rightly said that Gandhiji was successful because his adversary were Britishers; had he tried to fast against Hitler, he would have been dead long time ago. I do not care for what Digvijay Singh says because he is no better than a puppy dog of Madam Sonia. He has no credibility to pass judgment on what Hindus are doing after calling Ramdevji a thug and referring to bin Laden as Osamaji. The Uttarakhand government did move Swami Nigamanandji to a hospital, just as they did with Baba Ramdev. They should have paid serious attention to Swami Nigamanandji’s demands. It is a matter of great shame and pain that in free(?) and democratic (? ), saints die because of total indifference of people in power to genuine grievances of people. So far as the state government not stopping the quarrying is concerned, I would not pass a judgment without having all the information. When the central government is dragging its feet nay, putting all kind of road blocks in the path of having an effective Lokpal bill and bringing back the black money stashed abroad, why should we expect something different from any state government? They take their clue from their counterparts in New Delhi. May Swamiji’s soul rest in peace and may his sacrifice not go in vain.